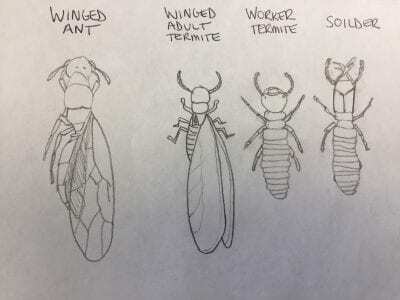 Termites Archives | Ecotech Pest Control, Inc.
Termite swarm sightings have been spotted, and we’re sure it won’t be the last! This entry was posted in Termites on March 9, 2017 by admin. Customer called to say they saw a swarm of termites by front of home. We treated the front of the home for the swarm. The customer signed up for our yearly maintenance service. This entry was posted in Termites on June 14, 2016 by admin. A customer called to say she moved a small fridge to find a swarm of termites, and noticed a small floor board had been chewed. We went to the home and found that the customer had ripped up some of the floor board to try to remove termites. This is something you should never do, never disrupt a swarm of termites, if they feel threatened they will move to another area. We foamed the holes and floor board for the customer, and also installed termite bait stations outside the home, which all homes should have to protect the home from outside. Troubled by termites? Contact us today before the termite damage to your home gets even worse. We’re here to help with all your exterminating needs. This entry was posted in Termites on April 5, 2016 by admin.